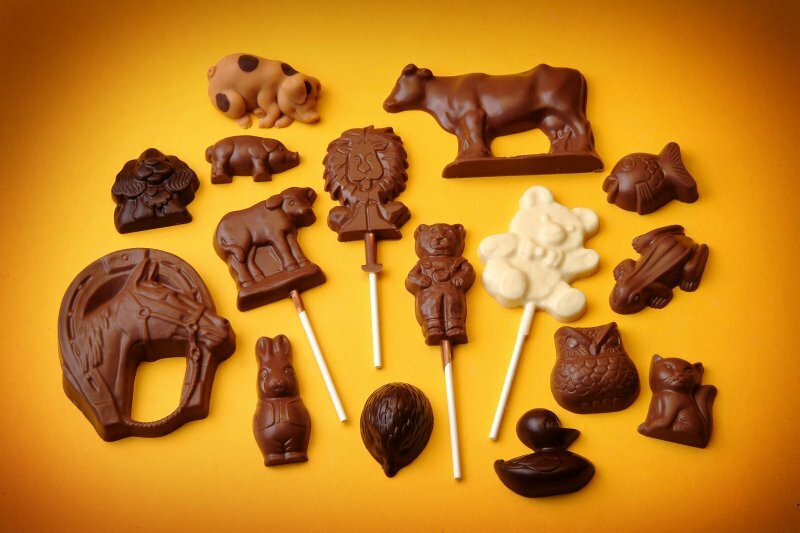 We produce a wide variety of chocolates, many traditional English styles as well as continental, and a few unusual chocolate figures and gifts. 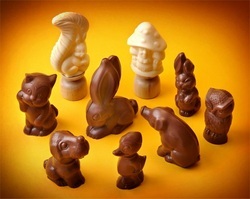 Our reputation rests on our choice of chocolate, our primary ingredient. We have sourced a high quality Belgian chocolate producer and customer feedback continually confirms that we have made the right choice! 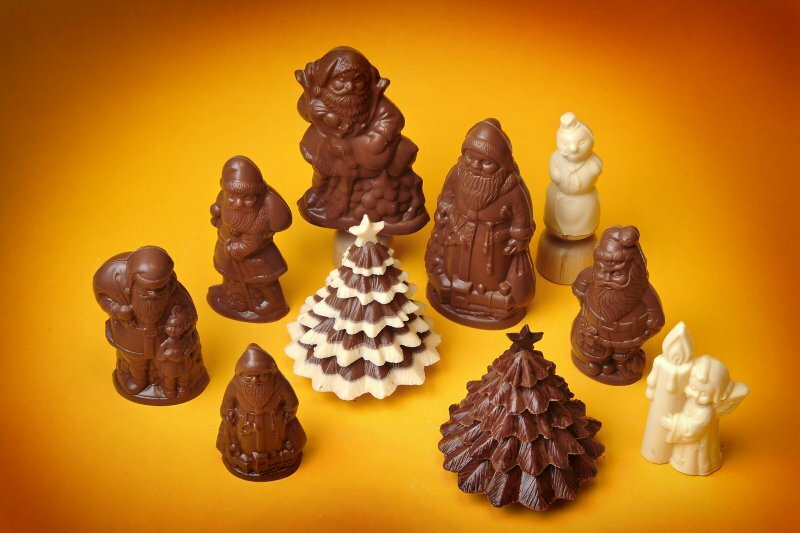 The chocolate can be enjoyed on its own in our bars , shapes and hollow figures and of course it is perfectly complimented by our enticing range of fillings and flavours in our chocolates and truffles. Our simple and distinctive packaging allows the contents to be appreciated. We also have a variety of gift boxes, such as the traditional ballotins pictured. 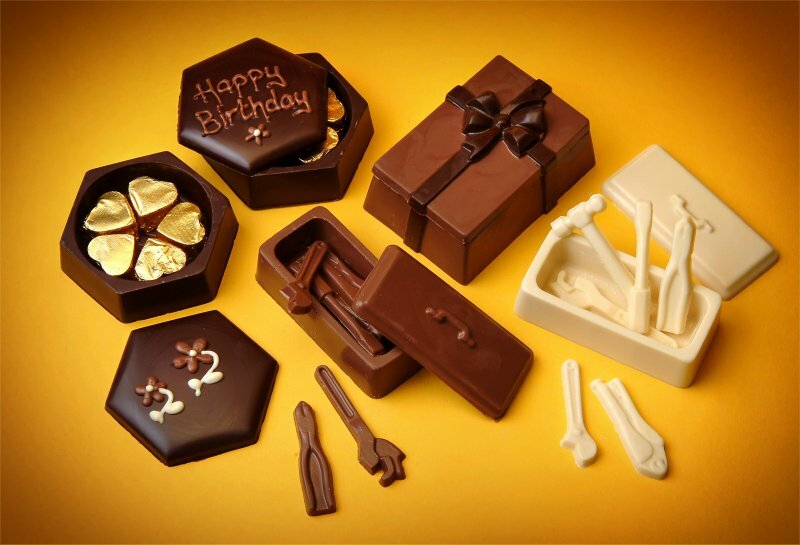 We can also make unusual gift arrangements to order by combining selections of chocolates and chocolate boxes and figures for that extra special gift! 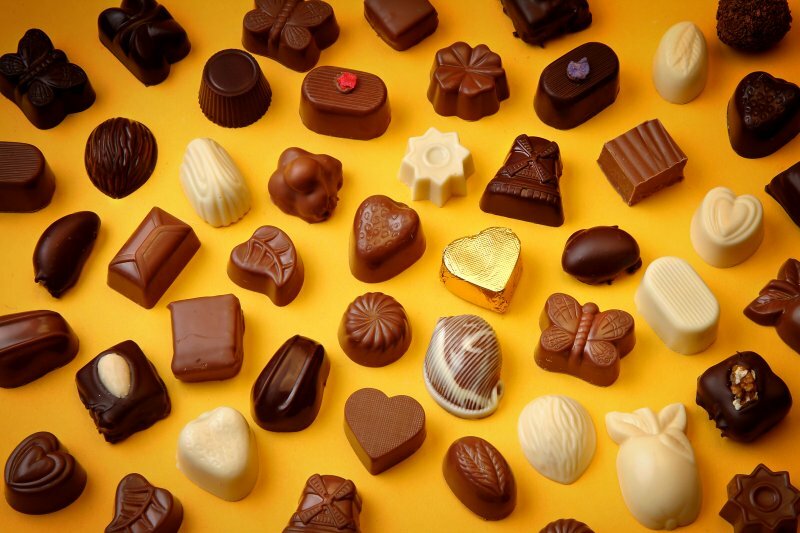 We create a variety of moulded and enrobed chocolates containing mouth-watering fillings. We make a number of English style fondant-filled chocolates, all available in plain, milk or white chocolate. In addition to our English style range of chocolates we have a great many other delicious flavours to tempt you. These include: Almonds, Brazil nuts, Citrus & Honey (one of our specialities), Ganache, Ginger, Guianduja, Hazelnuts, Hazelnut clusters, Marzipans, Peanut Butter (has to be tasted to be believed), Praline, Rum & Marzipan.Our Fresh Cream Truffles are made in small batches for special opccasions. We make a variety of flavours, including chocolate, white chocolate, rum, brandy, pistachio, ginger, banoffee (banana and caramel) and chilli. Our Florentines have become one of our most poplular products. They are simply solid discs of chocolate lovingly topped with chopped dried apricots, cherries, crystallised ginger, hazelnuts and chopped almonds and finished with a drizzle of contrasting chocolate. Chocolate, fresh double cream and choice ingredients and added flavours. Normally just rolled in grated chocolate or cocoa powder. Because of the relatively short shelf life (2 to 3 weeks) we do not tend to sell truffles through our stockists. We make them to order for selected local hotels and restaurants and of course we try to keep a stock in our shop, The Chocolate House in Dunster. Look out for them and snap them up when you see them! 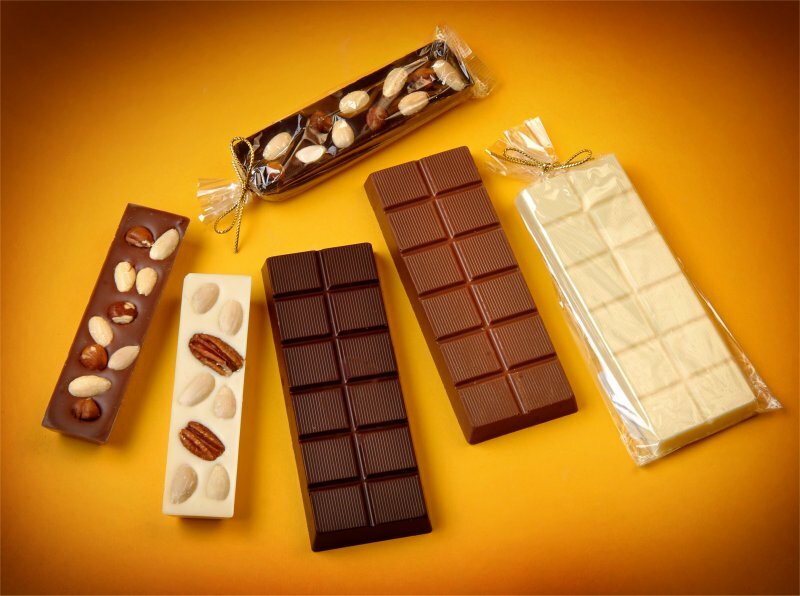 We create a variety of bars and chocolate shapes, only some of which are illustrated here. Chocolate bars in milk, plain and white chocolate, as well as strawberry and orange flavoured chocolate! Bars with nuts (almonds and hazelnuts illustrated), crystallised ginger and fudge pieces. We also make some blended chocolate bars - milk chocolate with a hint of strawberry, or white chocolate with a touch of caramel for example. A variety of figures and lollipops of all shapes and sizes. Some interesting and unusual chocolate boxes, which can be personalised and filled with chocolates of truffles for that special present. 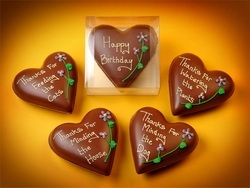 ...including our popular hand decorated hearts which can be personalised to order. 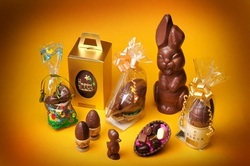 A range of luxury eggs, hollows and gifts. We are not in the "three eggs for the price of two" frenzy that seems to start in the supermarkets shortly after Christmas! 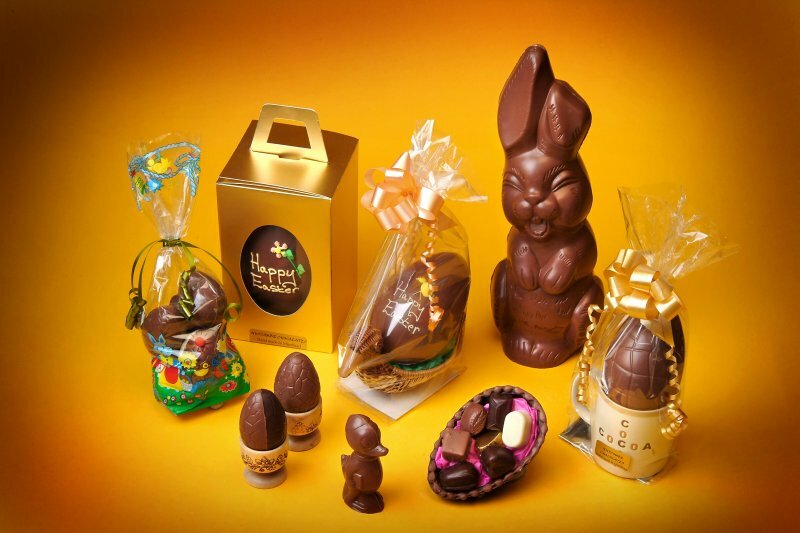 Our products are made in the run up to Easter so they reach you fresh, unlike the large manufacturers' eggs which have often been stored for months waiting for the space on the supermarkets' shelves. We can also personalise messages on eggs to order. 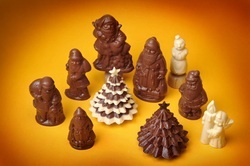 However, we do make some lovely hollow Christmas figures, as well as our very popular solid chocolate Christmas trees, pictured left. They make lovely table decorations and after Christmas there are no needles to clear up, just a few crumbs! Anything from our range would be ideal as a gift or as the basis for favours. Illustrated here are a few ideas for favours. 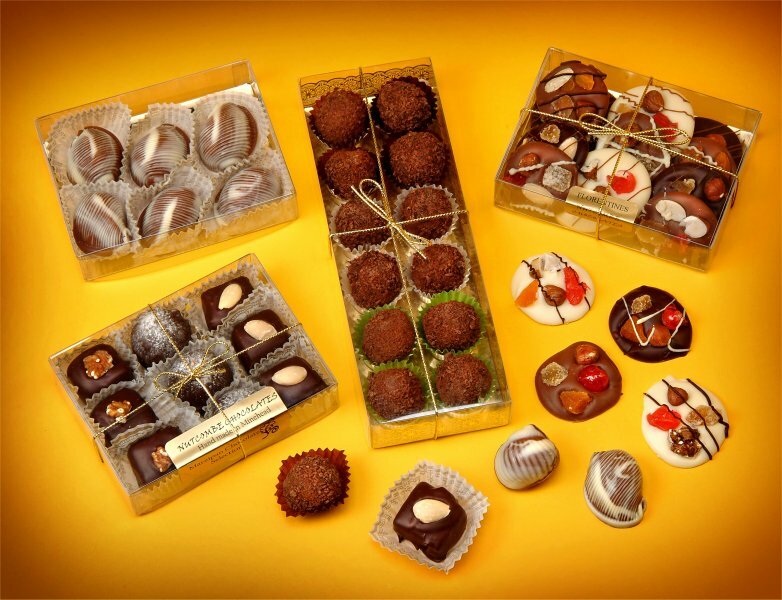 We can package any of our chocolates individually or in small gift boxes. Alternatively we can supply our chocolates loose to be packed or wrapped in your own boxes or bags. Why not have a look through our range or contact us for ideas for something unusual? 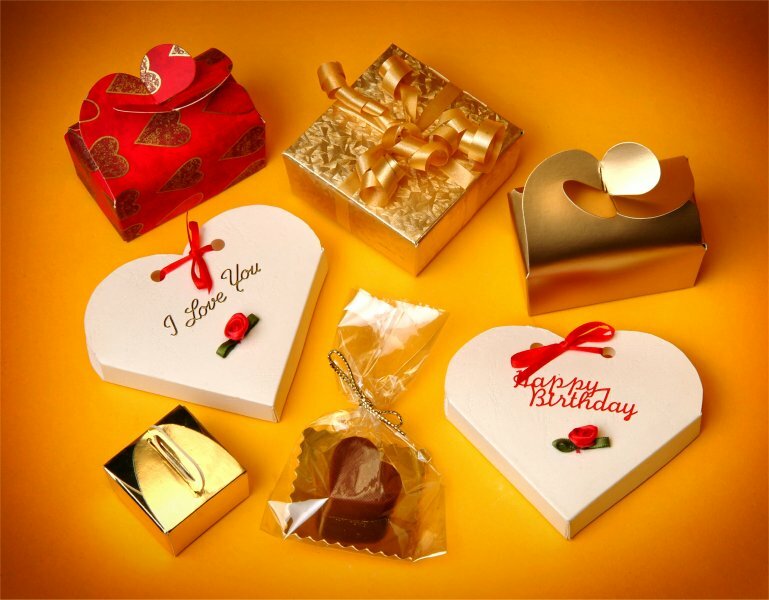 We can personalise a variety of chocolate boxes to make that gift extra special. Also, don't forget our decorated hearts (see the hollow figures above).